My husband and I cannot stop eating this! The recipe has a LOT of ingredients, but it is SO worth it! If you're not into "shopping and chopping," Costco has a very similar product with red lentils and mung beans instead of Garbanzos. It costs about $15 for a large container and it's really delicious. It's fun to play around with ingredients in this, I just like to think about what I would want in a huge Greek salad. 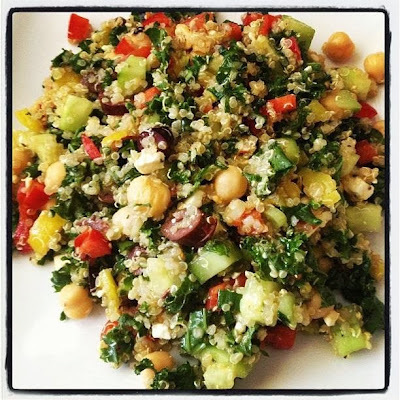 The quinoa can also be subbed out for orzo, Israeli cous cous, or brown rice. I use half water and half chicken broth in whichever grain I use to keep the flavor above and beyond delicious. If you're a vegan...skip the feta and use vegetable broth. You're good to go! In a medium saucepan, bring the water, broth and quinoa to a boil. Reduce it to a simmer, cover, and let it cook for about 12-15 minutes, until the liquid is absorbed and the quinoa is soft and fluffy. Remove it from the heat, transfer it to a strainer and run COLD water over the quinoa for about 30 seconds to bring the temperature down, stirring as you do so. In a very large bowl, combine ALL the other ingredients. I don't even bother mixing the dressing separately. Add the quinoa and toss everything together for about 1 minute until EVERYTHING is combined and coated in the dressing. Serve immediately.